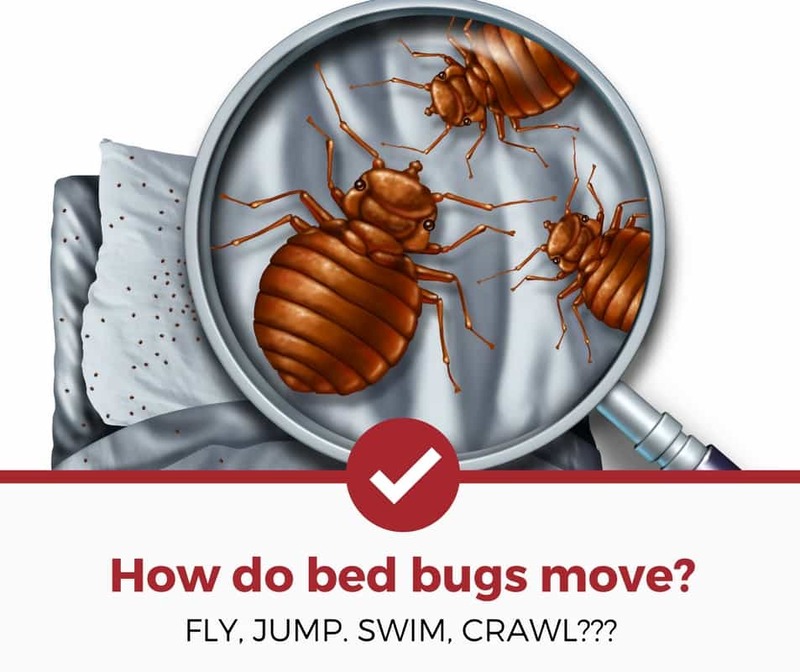 Curious how bed bugs move around? Let’s face it, if you have bed bugs, you’re going to want to know just about every thing you could possibly want to know about them in order to defeat them. They are very, VERY stubborn bugs, and ones you shouldn’t take lightly if you suspect you have an infestation. How Do Bed Bugs Move? How Do bed Bugs Get From Room to Room? How To Stop Bed Bugs From Moving Around? The short answer is no, they do not fly. Bed bugs are stubby little wingless oval shaped bugs. Thankfully, they can not fly across the room and land on your bed. If you think you see something flying around and it resembles some pictures of bed bugs you might have seen, chances are it’s a stink bug. Stink bugs look similar to bed bugs, except they don’t bite (just annoy you to death). Bed bugs do not jump. Unlike fleas, bed bugs do not have powerful hind legs that help them jump longer distances. This important, because if you lay down bed bug traps at the legs of your bed, bed bugs will not be able to get over them without falling inside. If you think you see something jumping around, it’s safe to say it’s not a bed bug, but most likely a flea. As an FYI, fleas do also bite and it’s common for homeowner to mistake a flea bite for a bed bug bite, even though the bugs look almost nothing alike. Bed bugs move like any other normal bug, by crawling around. They aren’t fast crawlers either. When your asleep, the CO2 you emit raise to higher levels, triggering bed bugs to wake up and start making their way to the source of the CO2 (usually a warm blooded mammal). And remember, bed bugs don’t move fast because they don’t need to. Their prey are often in an unconscious state. Moving slowly helps to reduce the risk that their target will awaken. If they don’t move fast, how are there so many? The main reason that the bed bug population has exploded in the recent years is the increased amounts of travel that people are doing. There’s just so much more opportunity for bed bugs to spread around. Bed bugs are REALLY good at holding on to things they are attached too (like shirts, bags, etc). If you do jump into a cab and the previous rider left a bed bug behind, you COULD take him or her with you back to your house. As a result, you now have a potential bed bug infestation on your hands. This is the main reason people THINK bed bugs move fast (but really they don’t). Read More: How to use a bed bug heater to kill bed bugs? So, this might freak you out a bit, but bed bugs can climb on walls (it's scary but true). There are numerous reported cases of homeowners who have affixed their bed with bed bug traps at the legs of their bed only to spot bed bugs climbing the walls to get around the traps. In general, bed bugs can't climb really smooth surfaces that well, but give them a little texture or an uneven coat of paint, and they'll be climbing in no time. After all this talk of bed bugs and their ability to travel, how do they get from room to room? This is a good question and one worth exploring for just a bit. When a bed bug starts its infestation, chances are they’ll make up their nest somewhere close to their food source (aka you). The closest place to settle for a bed bug is of course, a mattress (hence their name). If you opt to get a mattress protector (which we recommend you do get one), then the bed bug will probably either hide in the headboard of your bed or in some crack or crevice around you. You notice bites and freak out. After freaking out for a bit, you decide the best course of action is to sleep in the living room 20ft away. This is of course, a BAD IDEA. When the bed bug realizes that the food source keeping him and his or her family alive has left, they will go search for a new food source elsewhere. They can crawl through your wall outlets and end up getting inside wall voids inside your house. From there they’ll spread around until they find a new food source. When they find you lounging on your couch, they’ll set up their new home in that area as well. This is how bed bugs spread and get into new rooms in your house. When you realize you have bed bugs, there is only one thing you can do that will have any real impact on keeping the bed bug Infestation in one spot in your house. You need to continue to be the bed bug bait. This is also essential in bed bug elimination. Exterminators will often give you the same advice as apart of a treatment plan. They’ll instruct you to continue sleeping in the same location so that the insecticides and various traps deployed will have ample opportunity to take effect. The only saving grace here’s that bed bugs are not a major vector for diseases. Aside from a couple of itchy bed bugs bites (and they are itchy! ), you should be fine. Bed bugs do not do anything but crawl very slowly in search for a bloodmeal. The best thing you can do to keep them from spreading from room to room is to stay put in your bed and call an exterminator. Any questions let us know in the comments down below.